This bright, sparkling bracelet was designed by Sharon Evely using a mixture of shimmering crystal rondelle beads, matching seed beads and a multi-strand tube clasp. Follow Sharon's step by step project and learn how to weave your own dazzling bracelet, making it the perfect size for you or a loved one this Winter! We love the brilliant blue tones and the amazing shine! Cut a single or double arm span length of thread, depending on which is more workable for you. The longer the thread, the less you will need to add on extra thread. Thread a needle onto the thread and add a stopper bead, leaving a tail of 6 inches, which you will work into the bracelet at the end. Thread 1 x size 11 and 2 x size 15 seed beads 10 times. This is creating the width of your bracelet. To make the netting you need to add a further size 11 and 2 x size 15’s seed beads and thread back through the 9th size 11, creating a loop. Then continue to add 2 x 15’s, 1 x 11 and 2 x 15 and thread through the 7th size 11 creating another loop. Continue to do this until you reach the end of your row (remember to miss the next size 11 and thread through 5th, 3rd and 1st size 11 seed beads). Follow the instructions from step 2, adding rows until you reach the length of bracelet you require. 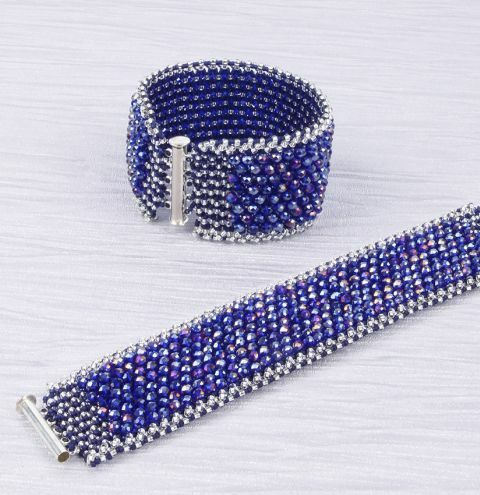 You will need to take a 1 ¼ inches off the overall size of bracelet you want, as you will need to add a clasp and further seed beads to increase the length of your netting, ready for adding the rondelles on the front. When you have your required length, you will need to add the magnetic clasp and position it centrally to the end of your work. Weave back through the entire second row from the end to add stability and exit at the top of your last row. Using the 5 holes on the clasp, weave through the end row until you are opposite your first hole of the clasp. Add 3 size 15 seed beads and thread through the hole and back into the same bead you came out of on your last row. Continue to weave and add 3 x size 15's each time you come to a hole in the clasp. To strengthen the clasp to your bracelet, weave back through your work and the clasp then exit at the top size 11 seed bead. To widen the netting you will need to add a size 11 seed bead between each of the gaps along the top edge. Thread through the 2 x size 15’s and add a size 11, continue to do this until you reach the end. Then add on the other half of your clasp to the end using step 4. Again, reinforce your clasp and exit the last size 11 seed bead. Then add a size 11 seed bead across the bottom of the bracelet, as you did across the top. To add rondelles to the front of your netting, divide your rondelles into two piles, then thread back through your bottom edge until you reach the centre line of the bracelet. Thread through the above size 11 bringing you out at the bottom of the diamond shaped netting and add a size 15, rondelle and size 15, then thread through the next size 11 seed bead exiting the diamond shape, then add another size 15, rondelle and size 15 and exit the diamond shape. Continue to do this until you reach the last size 11 seed bead in that row, then thread through the top line size 11 bead (that you added in step 5) and back down into the size 11 into netting row then down into the next 2 x 15’s and exit out of the size 11 which will be the top of your diamond shape netting again. Then add your size 15, rondelle and size 15. Continue to do this until you have used the first lot of your rondelle pile. Then weave back through the top line until you reach the centre row again and add your second pile of rondelles going the other way on your bracelet. You may have enough rondelles to reach both ends to the clasps, or you may have a few rows left to be filled. Follow the same process as above, but instead of using rondelles add size 11 seed beads. So size 15, size 11 and size 15. This will create a flatter area with the clasp to the underside of your wrist. Weave your way back to the top corner of your bracelet edge to add the final size 11's to enhance the top and bottom. On your end row thread down into the first size 11 seed bead (where previously you added your rondelle and size 15’s seed beads on step 6), then add 2 x size 11 seed beads and thread through the diagonal top size 11 seed bead of the next row on your edging, then back down through the size 11 bead on the second row and repeat until you get to the end. Weave down through until you reach the bottom corner of the edging and repeat the above step. Any threads you have left from adding on additional threads need to be weaved back into the bracelet. Then you are finished!